Monofilaments one of the oldest and most popular fishing lines on the market, and if you ask a non-fisherman to identify fishing line, monofilament is probably what will pop into their head. However, monofilament wasn’t always popular. When nylon monofilament was first created by DuPont in 1939, it was very stiff and wiry, making it quite hard to handle and cast. Users loved how strong and light it was, and its transparent nature, as well as great knot-holding abilities, but it took a while for monofilament to catch on, due to its difficulty of use. DuPont kept innovating, and by the 1960s they had created a soft, flexible nylon monofilament that still maintained the durability, low visibility, and tight knot holds that had made their first experiments a success. This new filament was very inexpensive, and it became very popular for use on entry-level rods and reels. Since then, monofilament lines have continued to lead the industry when it comes to effective, low-cost fishing line, and DuPont’s original formula inspired a huge variety of imitators. Monofilaments get their name from their design – unlike braided lines, monofilaments use just one long, extruded filament, resulting in a line with tons of stretch and durability that remains quite sensitive. Nylon is by far the most popular material, usually in either single-polymer or multiple-polymer configurations, depending on the fishing characteristics desired by the angler. However, some companies have begun creating monofilaments with more advanced polymers like Dacron, Dyneema, and PVDF (Polyvinylidene fluoride) that were previously only used for braided superlines. Let’s take a look at the advantages, disadvantages, and applications for monofilament lines now. 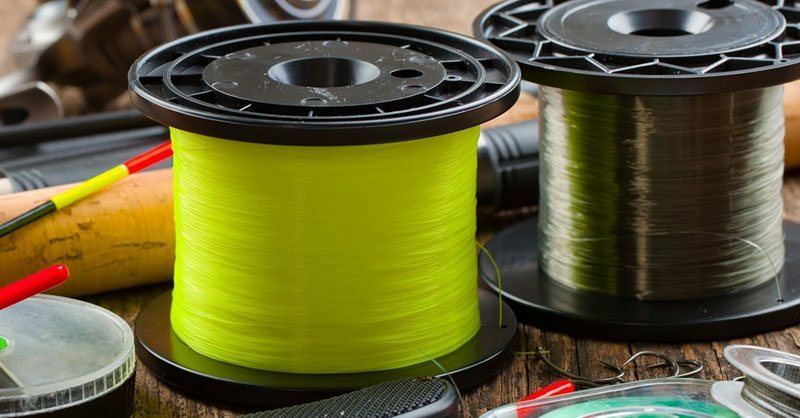 Nylon monofilaments are by far the most inexpensive type of line to produce, since these lines are made from less advanced materials, and are extruded in a relatively unsophisticated process compared to fluorocarbon and braided lines. Unlike braided superlines and heavy fluorocarbons, most monofilaments maintain a neutral water profile, making them very useful both for topwater rigs and for shallow suspension fishing. Most monofilament is completely clear, and refracts very little light in the water, leading to a nearly invisible water profile that won’t spook fish. The strength of monofilament is easily on par with fluorocarbon – though neither of these lines are as strong as braided superlines. That same stretchiness of monofilament makes it especially suited for newer anglers – if you set your hook incorrectly, or have a very tight drag and get a strike, stiffer lines have a tendency to punish you, either by snapping outright, or ripping a hole through the mouth of the fish you’re trying to catch. Monofilament can stretch quite a bit, and that makes it easier for more inexperienced anglers to set their hooks properly, and still catch fish even if they’ve got a tight drag. Some more advanced braided lines and fluorocarbons require specialized knots and sometimes even glue to make sure their knots have a great hold – monofilament’s softness and stretchiness mean that just about every knot type can be secured tightly and easily, again making it easier to use for novices or those who don’t want to bother learning a complicated knots. The stretchy characteristics of monofilaments – up to 25% stretch in some lines – mean that monofilaments can stretch to absorb shocks of hard fish strikes, and can also take quite a beating from obstacles in the water like rocks, wood, or whatever else you may be running into. There is a huge variety of monofilament on the market, made in different diameters, materials, colors, and for different applications. Some nylon monofilament and other materials tend to absorb water, and can degrade rapidly with use, especially under heavy heat and sunlight. Some of the more advanced monofilament materials manage to alleviate this problem, but monofilament is still generally the least expensive product on the market. The need for very high strength, durable lines that last a long time make monofilament a poor choice for intensive, deepwater fishing for large animals, as it can rapidly degrade, and its stretchiness can be a drawback when you’re working with longer line lengths. The more you use a given monofilament line, the harder it will be to work with, resulting in occasional snags and snare on the line when you’ve been using the same line for months at a time. Monofilament will require a much thicker line per pound of tensile strength compared to braided lines, though its tensile strength is on par with most fluorocarbons. This isn’t a drawback as much as it’s a specific application problem – if you need sinking line, look to fluorocarbon or braided superlines. In extended-duration applications, nylon monofilament has a tendency to become logged with water, which reduces its strength and makes it heavier. While monofilament is pretty sensitive, the stretchiness that makes the material forgiving and easy to use can lead to a mushierlinefeel, making it harder to discern light bites from smaller quarry. Monofilament is best for smaller, freshwater all-purpose fishing, and in heavier weights it can be used for more heavy-duty, specialized applications, though often you’d be better off with superlines in those cases. It’s especially suited for novice anglers who need more experience to be able to use a more sensitive and non-stretchy line. This is one of the main reasons that entry-level rods usually come with a nylon monofilament installed – along with its low price, of course. Monofilament is great if you tend to favor topwater fishing rigs and suspending rigs, as it doesn’t sink readily and can easily maintain a neutral water profile underwater. And of course, monofilament is perfect for situations where you require its strength and shock absorbency – it’s well suited to some larger fish that tend to struggle, and can be surprisingly strong at larger diameters. Just make sure you’ve got a large enough reel to accommodate a thick monofilament. Monofilament is also popular as a leader and tippet – its near-transparency in the water makes a thin monofilament the perfect material to use at the end of a thicker superline or fly line, as it won’t spook fish and lends a natural presentation to your lures. 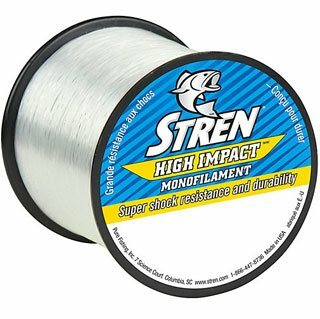 This monofilament from Stren is about as classic as you can get. It comes in a gigantic reel with plenty of yardage-per-dollar, and it’s available up to a 60lb test line, so there are plenty of options no matter what kind of game you’re fishin’ up. It’s tough, invisible in the water, and abrasion resistant, and has great knot strength, just like all nylon monofilament lines. It’s great for use by itself, or as a leader or tippet if you need to top off a superline, or a fly line. 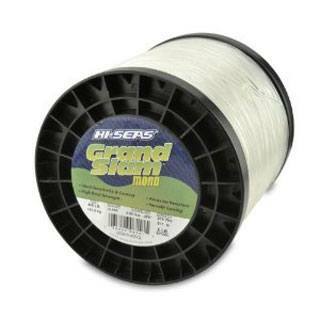 It’s not going to win beauty contests, it doesn’t incorporate high-tech flash and wizardry, and it’s not going to catch the fish for you, but it’s a great deal, a great line, and a great spool to have stashed in your garage when you need to restring a bunch of rods. This line from Berkley is quite interesting – it’s almost a hybrid line, but it’s closer to a standard monofilament than a superline or other braided line. It uses a unique gel-spun polyethylene hybrid. It features hundreds of microscopic monofilaments that are all aligned and pressed together, resulting in a line that has braided superline characteristics such as minimal stretch and incredibly high tensile strength, yet remains soft and pliable, with a near-transparent water profile. This results in a line that casts like a dream, has incredible durability, and minimizes the drawbacks of typical mono – it won’t get waterlogged, it doesn’t stretch too much, and it holds up well in all conditions. If you’re looking for a high-tech mono replacement, you’re gonna want to snag this spool up. Trilene is Berkley’s proprietary multiple-polymer nylon blend that’s specifically meant to emphasize the positive attributes of monofilament while the reducing negative characteristics such as line-soddening, lower sensitivity, and lower longevity. The result is a strong, durable monofilament product that combines a high tensile strength with a much more controlled stretch – it won’t be nearly as stretchy as standard mono, so it’s a bit harder to use, but this means increased sensitivity without sacrificing a bit of line forgiveness. Some people swear by monofilament for trolling applications, and if you want to try it out for yourself, this line from Hi Seas is certainly appropriate. Unlike most monofilaments, it’s incredibly durable, and suited for saltwater as well as freshwater trolling operations, and while it’s a bit less sensitive and more stiff than other nylon mono, it doesn’t sacrifice shock absorption or durability, so it’s great when you’re getting hits from big fish in deep waters. However, it is quite a bit stiffer than thinner diameter, less strong mono – it’s quite hard to use on smaller rods and reels, and in situations where you’re casting and retrieving often. This makes it better suited for trolling applications, whether in saltwater or in deep freshwater lakes. Spiderwire is mainly known for their line of top-notch braided superlines, but this product is a high quality, durable monofilament, built out of an ultrathin, proprietary monofilament blend that’s 33% stronger than standard monofilament while still maintaining the same diameter. It also doesn’t stretch quite as far as cheaper mono – 15% rather than the 25%+ that can be seen in some bargain products, making it ideal if you love monofilament, but don’t need the excess stretchiness that can come along with it. It’s a great choice if you’re trying to bridge the gap between more inexpensive monofilaments and more expensive, easily visible superlines, and a durable, easy-to-use line that’s useful in just about any water conditions.